Using an effective submarine delivery, pitcher Billy Rhines won 113 games in nine major-league seasons. Like rookies Mark Fidrych in 1976 and Fernando Valenzuela in 1981, Rhines burst onto the big-league scene with phenomenal success. As a 21-year-old rookie on the Cincinnati Reds in 1890, he achieved an 18-2 record in his first 20 starts. Harrington also drew praise. He and Rhines knew “each other’s signs as well as a magician and his female attendant,” and Rhines attributed much of his success to his talented catcher.17 Harrington “had no trouble in handling” Rhines’s “underhanded shoots” and was “able to throw to the bases from a squatting position, a novelty at the time,” wrote historian Lee Allen.18 Off the field, Rhines and Harrington were “sensible young ballplayers,” who “do not intend to throw away their chances by indulging in dissipation [alcohol abuse] or bad hours.”19 But that would change. Bothered by a sore arm, Rhines lost 16-8 at Chicago on July 22.31 Yet on August 3, he hurled his only shutout of the season, beating Nichols and the Beaneaters again.32 Rhines finished the year with a 17-24 record in 372⅔ innings and a respectable 2.87 ERA. The Reds reinstated Rhines and Harrington in July. In his first game back, on July 13, Rhines hurled a four-hitter in a 3-1 victory over the Brooklyn Grooms.39 A week later, with Harrington as his catcher, he defeated the Senators, 3-2, in an 11-inning contest at Washington.40 In the third inning, Rhines slugged a solo home run, the only homer of his career. The final straw came on August 17 in Cincinnati. 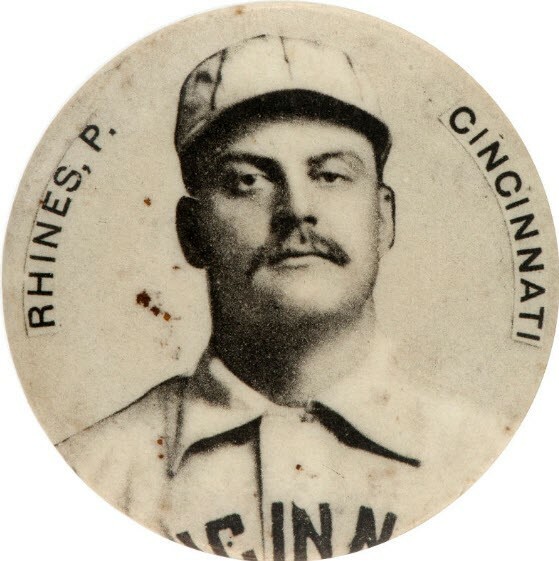 Rhines was taken out of the game after giving up nine runs in three innings to the New York Giants.44 After the game, the Reds released both Rhines and Harrington. The Louisville Colonels gave the pair a one-month trial in 1893, but both men failed the test and were let go. Rhines lost four of five starts, and in 31 innings, he walked 19 batters and struck out none. Harrington batted .111 in 10 games, and he and Rhines were fined “for imbibing too freely.”45 Upon his release, Harrington’s career ended, but Rhines would work his way back to the majors. In 1894 Rhines pitched 406⅔ innings and compiled a 25-19 record for Grand Rapids (Michigan) of the Western League. It was a hitters’ league, and Rhines allowed a whopping 436 runs during the season. Nonetheless, he was drafted by the Cincinnati Reds, who were willing to give him another chance. The Reds were desperate for help after their pitching staff recorded a league-worst 5.99 ERA in 1894. Rhines pitched another dazzling two-hit shutout on May 20, against the Phillies.51 But misfortune struck four days later: A “hot liner” off the bat of Louisville’s Doggie Miller hit the middle finger of Rhines’s pitching hand, fracturing the digit.52 The injury caused him to miss more than two months of the 1896 season. He finished the year with an 8-6 record and a league-leading 2.45 ERA in 143 innings. The next season Rhines compiled a 21-15 record with a 4.08 ERA. On August 7, 1897, he “had not only speed, but grand command and the best use of his famous underhand ball,” in a three-hit shutout of the Louisville Colonels.53 Louisville’s Honus Wagner, a 23-year-old rookie, went hitless in the game. Rhines pitched for an All-American team on a barnstorming tour with the Baltimore Orioles from October to December, 1897.54 In the midst of the tour, the Reds traded him to the Pittsburgh Pirates. Rhines’s father died in September of 1899 and left him an inheritance.61 Perhaps this affected his decision to leave baseball and stay in Ridgway and work as a lumberman.62 Except for a brief stint in 1901 with the Grand Rapids team of the Western Association, Rhines was done with professional baseball. A longtime bachelor, Rhines got married in 1912 at age 43, to 23-year-old Kozie Lorraine Milliron.63 By 1920 they had four children and Billy operated a taxi service.64 After a long illness, he died of heart disease on January 30, 1922, in Ridgway, at the age of 52. 1 Elk County Advocate (Ridgway, Pennsylvania), October 9, 1873. 2 1870 and 1880 US Censuses. 3 Sporting Life, July 25, 1888. 4 Davenport (Iowa) Daily Republican, June 29, 1889. 5 Chicago Tribune, July 5, 1889. 6 Sporting Life, October 30, 1889. 7 Chicago Tribune, April 23, 1890. 8 Cincinnati Enquirer, May 1, 17, 20, 1890; Philadelphia Times, May 3, 1890; Chicago Tribune, May 8, 1890; Pittsburgh Press, May 11, 1890. 9 Chicago Tribune, May 27, 1890. 10 Sporting Life, May 24, 1890. 11 Cincinnati Enquirer, June 18, 1890. 12 Cincinnati Enquirer, July 2, 1890. 13 Cleveland Plain Dealer, May 3, June 3, 1890. 14 Cincinnati Enquirer, May 23, 1890. 15 Cleveland Plain Dealer, May 1, June 3, 1890. 16 Sporting Life, July 12, 1890. 17 Pittsburgh Dispatch, June 1, 1890; Sporting Life, January 24, 1891. 18 Lee Allen, The Cincinnati Reds (Kent, Ohio: Kent State University Press, 2006), 37. 19 Cincinnati Enquirer, June 22, 1890. 20 Cincinnati Enquirer, June 21, July 2, 5, 8, 1890; Philadelphia Times, June 26, 1890; Sporting Life, July 5, 1890. 21 Pittsburgh Daily Post, July 9, 1890. 22 Cincinnati Enquirer, June 13, 1890. 23 Pittsburgh Daily Post, August 5, 1890. 24 St. Louis Post-Dispatch, August 10, 1890. 25 Cleveland Plain Dealer, August 17, 1890. 26 Minneapolis Star Tribune, October 8, 1890; Sporting Life, October 18, 1890. 28 Cincinnati Enquirer, May 13, 1891. 29 Boston Post, June 2, 1891. 30 Philadelphia Inquirer, June 10, 1891. 31 Sporting Life, July 18, 25, 1891. 32 Boston Post, August 4, 1891. 33 Sporting Life, March 26, 1892. 34 Philadelphia Inquirer, April 24, 1892. 35 Sporting Life, April 30, 1892. 36 Cincinnati Enquirer, May 6, 1892. 37 Cincinnati Enquirer, May 12, 1892. 39 Sporting Life, July 16, 1892. 40 St. Paul (Minnesota) Globe, July 21, 1892. 41 Philadelphia Inquirer, July 27, 1892. 42 Philadelphia Inquirer, August 3, 1892. 43 Cleveland Plain Dealer, August 10, 1892. 44 Cincinnati Enquirer, August 18, 1892. 45 Philadelphia Inquirer, June 6, 1893. 46 Don Doxsie, Iron Man McGinnity: A Baseball Biography (Jefferson, North Carolina: McFarland, 2009), 35. 47 Cleveland Plain Dealer, August 16, 1895. 48 Cincinnati Enquirer, April 25, 1896; Cleveland Plain Dealer, May 3, 1896. 49 Sporting Life, September 25, 1897. 50 Cincinnati Enquirer, May 7, 1896. 51 Philadelphia Times, May 21, 1896. 52 Cincinnati Enquirer, May 25, 1896. 53 Cincinnati Enquirer, August 8, 1897. 54 Sporting Life, October 30, November 27, December 4, 1897. 55 Pittsburgh Post-Gazette, September 7, 1898; Pittsburgh Press, September 21, 1898; Sporting Life, October 1, 1898. 56 Pittsburgh Press, March 12, 1899. 57 Pittsburgh Post-Gazette, May 18, 1899. 58 Washington Star, June 1, 1899. 59 Pittsburgh Post-Gazette, June 23, 1899. 60 Pittsburgh Press, June 24, 1899; Sporting Life, August 12, 1899. 61 Sporting Life, November 18, 1899. 65 Washington Star, June 17, 1899. 66 Peter Morris, A Game of Inches: The Stories Behind the Innovations That Shaped Baseball (Chicago: Ivan R. Dee, 2010), 82.